Happy Monday my dear readers!!! Here in Switzerland we seemed to have gotten all the summer rage there was for us from February to June (those months were actually gorgeous) and now we are having the spring we missed out on - oh well - plenty of time to catch-up on untried nailpolish and unseen movies, right? and outside in the shade - just look like those iridescent glitters - swooooooon…. I applied three effortless coats of Girly Bits Food Fight over my regular Base Coat. The consistency is signature jelly and the glitters flow well dispensed and easily onto the nail. The dry time is fast to normal and the surface is slightly uneven due to the glitters. But surprise, surprise, this is no Top Coat eater - one coat of Glisten&Glow HK Girl was enough to keep that guy shiny and smooth for three days. I subscribe to Llarowe's A Box Indied which means that you get one box a month holding five items of Indie wonders for 50 US Dollars. So far, this splurge was worth every penny - I discovered so many beautiful polishes and great brands that I probably would have given a pass elsewise. I look forward to reading your comments - thanks for dropping by!!! Oh, what a gorgeous polish this is! That is iridescent glitter is just awesome!! 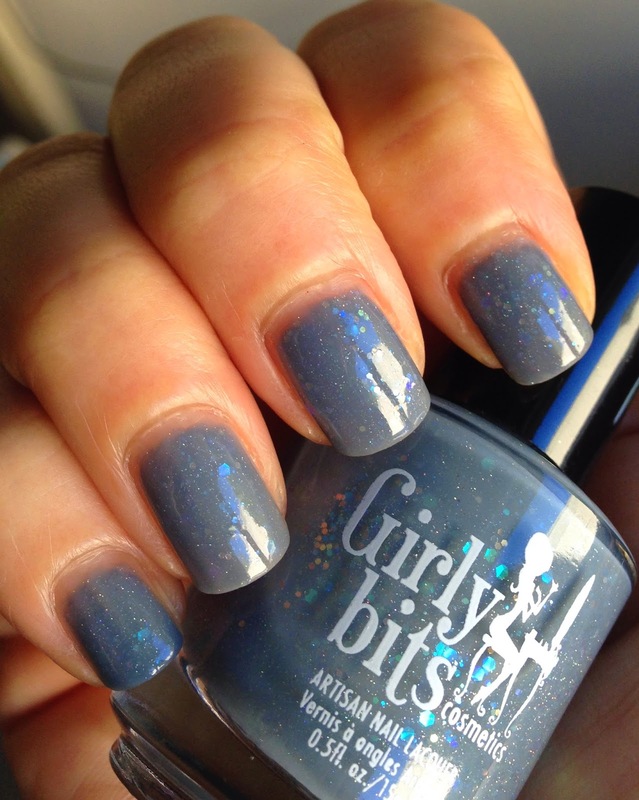 I just love your hyperbole :) Ypu express the emotion of utter nail polish delight perfectly <3 Food Fight is, like, ridiculously cool (and my love of shark grey polishes is reignited). The indie subscription box is just such a lovely idea. Do you know what's in these when you order, or are you surprised?